Samuel Adams beer is a favorite among American beer drinkers. It is offered in many varieties, some staples and others as seasonals. 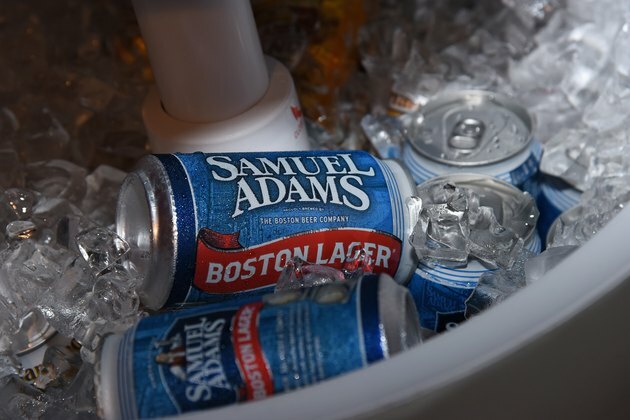 Popular Sam Adams beers include the Boston Lager, Light Lager, Winter Lager, Summer Ale and Octoberfest. The Winter Lager, Summer Ale and Octoberfest beers are seasonal brews available for short periods during the year. The Boston and Light Lagers are available year-round. Samuel Adams Boston Lager is a complex beer that was first offered to the public in 1984. Since then, it has become a staple in the Samuel Adams line up. A 12-oz. bottle of Boston Lager has 175 calories, 18 g of carbohydrates and 2 g of protein. It contains 4.9 percent alcohol by volume. Samuel Adams Light Lager is an award-winning brew. It contains 4.07 percent alcohol by volume. From a 12-oz. bottle, you consume 119 calories, 9.6 g of carbohydrates and 1 g of protein. Samuel Adams touts its Winter Lager as a warming, spicy brew. From a 12-oz. bottle, you consume 200 calories and 20 g of carbohydrates. This brew is available during the winter months each year. Samuel Adams Octoberfest is one of the top Octoberfest brews on the market. This beer is a blend of five malts, made to welcome in the fall weather. From a 12-oz. serving, you take in 180 calories and 18.7 g of carbohydrates. This brew is available annually during the fall months. The brewery offers a light, seasonal brew offered during the summer months. Its citrus flavor has many people coming back for more. A 12-oz. bottle contains 150 calories and 10 g of carbohydrates.